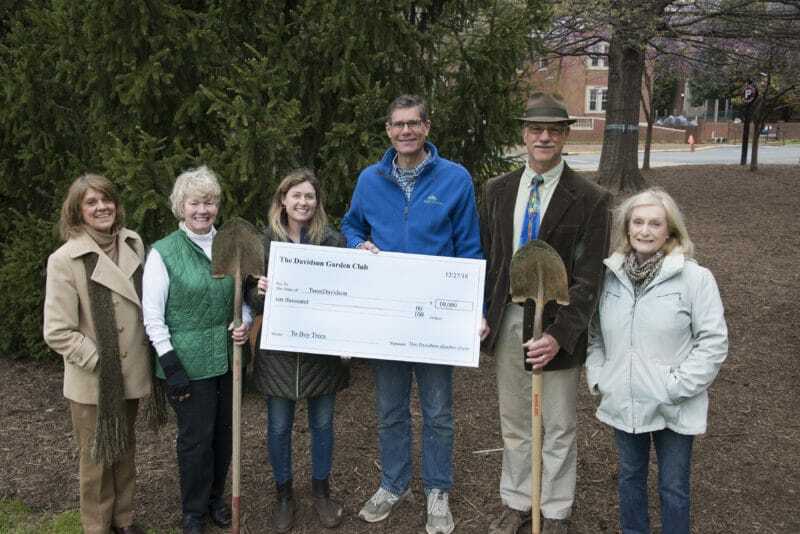 Davidson will soon be $10,000 “leaf-ier,” thanks to a donation from the Davidson Garden Club (DGC) to the TreesDavidson organization. Sara Dumser, president of DGC, said the club periodically makes modest donations to Charlotte-area groups that promote horticulture, such as Wing Haven, Rosedale, Davidson Lands Conservancy, and the UNCC Botanical Gardens. The 40-member non-profit group also dips into its treasury occasionally to provide scholarships for young gardeners to attend its annual Horticultural Symposium. That day-long event—its 35th annual— this year attracted its maximum capacity of 490 registrants. The $100 entry fee from symposium attendees left DGC with a large kitty, and a decision about what organization should receive it. DGC settled on TreesDavidson after hearing a presentation about the group’s activities, and urban forestry in general, from TreesDavidson prime movers, David Cable and Gordon Clark. TreesDavidson has planted more than 500 trees since the Davidson group was founded six years ago. That total includes 70 at the new Plum Creek Park, with plans for an additional 500 trees there. Clark said the DGC gift will enable the group to move forward with its ambitious reforestation plan in the town’s Fisher Farm park. TreesDavidson has planted 50 trees there, so far, and has plans to plant 300 more.